LOS ANGELES (CNS) – A Los Angeles County supervisor called Tuesday for policies to protect tenants in gentrifying neighborhoods and suggested that studies of the issue could be funded by landlords. Supervisor Hilda Solis previewed a motion, co-authored by Supervisor Sheila Kuehl, directing staffers to look at policies that protect rental rates, tenant tenure and freedom from discrimination. She also proposed an analysis of state and federal laws that regulate the private rental market. Long-term tenants are interested in investing in their community and should benefit when property values go up, Solis said. Implementing new policies and advocating for legislative changes, if needed, could be costly, but the motion offers a solution. “There need be little or no cost to the county general fund if administrative costs are recovered through a small per-unit fee paid by landlords,” it states. The motion is expected to be considered next week. The gentrification of the historic Boyle Heights neighborhood serves as the basis for the new web series “Gente-fied”, which according to America Ferrera, one of the show’s stars, uses humor as it tackles identity and generational conflicts for Latinos in the United States. “I read the script and I laughed, cried and saw my experiences mirrored. The kind that I identify with a lot and that I have not seen represented before in television and films”, Ferrera said who was also the new series’ executive producer that premiered this week at the Sundance Film Festival. The 32-year-old actress, of Honduran descent, said she grew up in Los Angeles and knows the struggle of wanting to “embrace” the American culture, but from the “deep roots” of a traditional Hispanic family. “It is a conflict, a sort of identity problem that is very much present in ‘Gente-fied’”, Ferrera pointed out. Set in Boyle Heights, the series alternates from English to Spanish, exploring the effects of gentrification through seven characters. With light-hearted humor, issues such as the financial burdens of small business owners due to unstoppable rent increases are presented as well as the challenges of a gay Chicana artist. Gentrification, the process by which the traditional inhabitants of an area are displaced by another population with higher purchasing power, is a matter that the series does not only show from an economic perspective but through its effect on the culture and daily lives of Latinos. “One of my favorite episodes is the one about a mariachi group, who has played in the Mariachi Plaza for a long time. But when the youth and the ‘Chipsters’ (Chicanos and hipsters) move into the neighborhood, no one wants to listen to the old ‘boleros’ and the mariachi start to play ‘I Want It That Way’ by the Backstreet Boys,” Ferrera said. The uniqueness of Boyle Heights, a landmark of Chicanos in Los Angeles is also an aspect highlighted in the show. “When you go to Boyle Heights, the culture is so rich that you almost feel as if you’ve left Los Angeles and have entered a microcosm in another world,” she said. “The first film I did was completely shot in Boyle Heights, but (the neighborhood) has changed a lot,” Ferrera recalled referring to the new “artsy” businesses and “trendy coffee shops” that have changed the area’s ecosystem. The all-Latino cast also includes Alicia Sixtos, Edsson Morales, Sal Velez Jr. and Victoria Ortiz. Gente-fied was created by Marvin Bryan Lemus and co-written by Lemus and Linda Yvette Chávez. 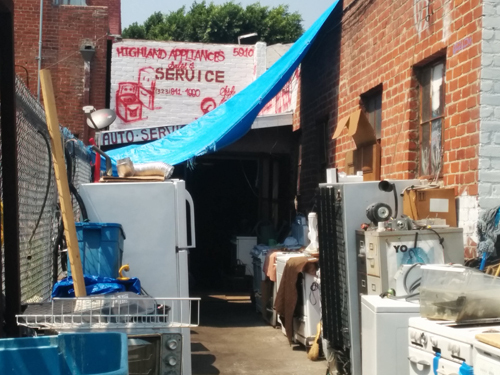 Long time Boyle Heights residents and activists continue to accuse developers and real estate investors of carelessly changing the character of their neighborhood to accommodate higher-income residents moving to the area due to its proximity to downtown Los Angeles. In one of two recent cases, the owner of OK Market on the corner of Whittier Boulevard and Hollins Street reached a settlement in court Tuesday with his landlord/agent Brian Neman of Hyde Property Management LLC. The agreement comes after three-months of fighting to nullify a 30-day notice to vacate the retail site, despite not being in violation of the terms of his lease, according to the market owner’s sister, Maria Ramirez. The terms of the settlement were not disclosed, but it’s expected OK Market will leave. 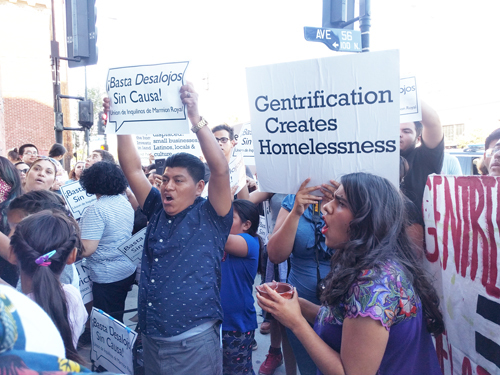 It comes one day after supporters, led by Union de Vecinos, a network of local Boyle Heights residents fighting gentrification—gathered outside of the market and delivered 300 petition signatures to the building in support of allowing the market to stay. A few blocks away, owners of Carnitas Michoacan, a popular restaurant open 24-hours a day that has been in the neighborhood for 33 years, recently received a notification they have until the end of this month to move. 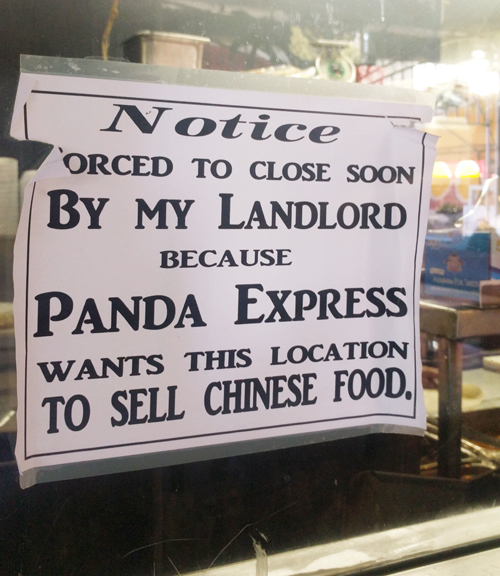 A sign on a window reads, “Forced to close soon by my landlord because Panda Express wants this location to sell Chinese food.” The long-time restaurant owners say they are worried about the future of their business. Co-owner Richard Raya told EGP he couldn’t say much about the issue since they are in litigation with the property owner. Raya said, however, that people should be allowed to decide which restaurants or stores they want in their neighborhood. Union de Vecinos says that the displacement of these businesses is another sign of the non-stop gentrification movement in Boyle Heights. “The rebuilding of the 6th Street Bridge, (a block away from the market), the proposed 1,000 units of luxury housing on the Sears site (3 blocks away), and the influx of galleries located around the area are causing real estate prices to rise,” the group said in a statement. Union de Vecinos said investors and developers are coming into Boyle Heights with their vision of what they think the neighborhood needs, ignoring the struggles many in the predominantly low-income Latino community face to make ends meet. “We need laundromats to replace what was burned down and torn down,” the group said, referring to a laundromat on the corner of Whittier and Boyle Avenues that burned down a few months ago. Just a few blocks from a major commercial corridor in Highland Park where storefronts have changed and property values have increased, east and northeast Los Angeles area residents gathered Saturday for a panel discussion on what it means to be a good neighbor. Within minutes it was clear that for many gentrification and housing affordability are a big part of the equation. The meeting was held at the Temple Beth Israel of Highland Park and Eagle Rock, a site that has withstood the many changes going on around the nearly century old synagogue. “Renters are getting evicted because the cost of housing is very high, meaning renters get priced out of their homes in neighborhoods that are becoming attractive, like Highland Park, Lincoln Heights and Boyle Heights,” said moderator Helen Leung, co-executive director of the nonprofit LA-Más. “The term gentrification is very loaded but I’m hoping we can discuss how we can minimize displacement,” she said, attempting to frame Saturday’s dialogue. 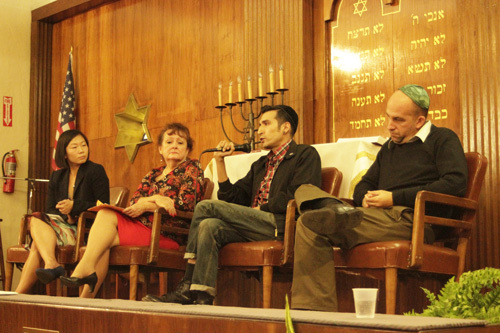 Panel speakers included Los Angeles Unified School Board President Steve Zimmer, Elena Popp, a Lincoln Heights resident and Executive Director of the Eviction Defense Network, and Shmuel Gonzalez, a community activists and historian from Boyle Heights. According to Popp, when asked what it means to be a good neighbor her first reaction is to describe someone who is friendly and doesn’t have loud parties. But as “la abogada” (the lawyer), she knows it means helping your neighbor stay in the neighborhood. 700,000 tenants are evicted every year, Popp emphasized. “We need to develop more affordable housing and make sure the number of [market rate] developers are restricted,” she said, citing the Wyvernwood Garden housing project in Boyle Heights as an example where a development could force longtime neighbors from their homes. For renter’s rights and affordable housing advocates, Wyvernwood has become synonymous with eastside gentrification. Plans to demolish and replace the 1,187 World War II era apartments to make room for a proposed mixed-use development project has led to mixed emotions in the community. Many activists claim gentrification is just another word for racism because it displaces mostly low-income Latino families. “We shouldn’t pretend there isn’t a significant amount of profit on the backs of the working class families being displaced,” said Zimmer. “It’s up to us affected and not affected to raise enough attention for this to be addressed,” he said, prompting applause from the 50 or so people in the audience. In general, the panel agreed that both low income and market rate housing are needed to preserve a community’s viability and attractiveness. “We need to have that option so people can get out of low-income housing,” said Gonzalez, referring to higher earning residents who want to stay in the neighborhood but want better housing options and amenities. Zimmer said developers visit him throughout the year hoping to entice his support for a local housing project with promises of developer fees for a particular school. In his view, the fees are just “used to hush a particular neighborhood” so he’s inclined to deny giving his support. Annabella Mazariegos of Boyle Heights says longtime community activist like her cannot be silenced. “A positive change in property values and new businesses should not mean a change in the people who live there,” she said. So, if that’s the case, then how does a community respect those individuals who have lived in the neighborhood for 50 years as well as those who moved in 50 days ago, Leung asked the panelists. It’s something he has witnessed firsthand at LAUSD schools, where some individuals or groups push their personal agendas or interests. “When a parent advisory group is suggesting school funds be used for a garden and not an intervention program I’m going to ask who is on the council,” he elaborated. Gonzalez pointed out that Eastside communities like Boyle Heights are already dense, causing parking issues and other problems that cause tension among neighbors. Gonzalez said it’s a form of racism taking place on the Eastside and pointed to a 2014-firebombing in the Ramona Gardens housing project that many people believe was a hate crime. The firebombing targeted three black families and one Latino family in the public housing complex, where the vast majority of residents are Latino. Landlord, Cecilia Dominguez, 62, of Elysian Valley, says the issue is complex. She told EGP she understands the dilemma of not wanting to displace a family, which reflects the key culture of a community, but as businesswoman she also has to do what she needs to stay afloat, and that could be to raise rents. According to Dominquez, the properties she purchased decades ago have gone up in value, but so have her property taxes to reflect new higher property value assessments. “I don’t want to [raise rents] but my property taxes are going up so I know I will eventually have to,” she said. While Dominguez sees the discussion as a good start to framing and addressing the issue of renter displacement, she was disappointed no real solutions were reached. She said she hears over and over that a change in demographics [to higher income] in the community will translate into better streets, betters school and better options. Amada Decoloma cried helplessly when she saw water dripping from the ceiling of her beauty salon when it rained last month. Emilia Salvatierra is still in shock after learning just five months after buying her business that her rent may double. Juan Galvez is looking to lease a new location for his appliance store after being told by his landlord he had to move. These are just a few of the scenarios playing out along a commercial corridor in Highland Park, and other nearby areas. It’s a complicated issue with many sides to the same story. For some, the term gentrification evokes images of greedy developers throwing people out of their homes. For others, it represents the revitalization of the community and a chance to make some money on their property. Caught in the middle are the people who don’t own land but nonetheless pay for it in rents and lease agreements. 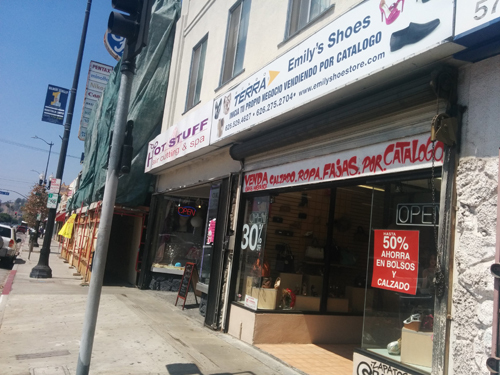 “I’ve seen people coming from other states – Texas, Iowa, Utah – who want to rent here and now we are being kicked out,” said Galvez, who was recently forced to move out of his appliance store on North Figueroa Street after eight years in the same location. Galvez said he had no choice but to leave because his tenancy was month-to-month, which worked fine with the previous property owner. “We got along well so I never renewed my lease when it expired a few years ago,” he told EGP. He admits that the new landlord –Engine Real Estate LLC – offered to help him find a new location in the area and to help him move, but said what they showed him was not suitable. He also doesn’t have the money it would take for a new security deposit and move-in costs. But in the end they are in business and want to make a reasonable return on their investment, $10 million in the area between Avenue 57 and Avenue 59 on Figueroa, he said, explaining why they can’t just keep rents the same. In the interest of full disclosure, Eastern Group Publications, publishers of this newspaper, is one of the businesses that will soon have to move from its location on Avenue 59 that is now owned by Engine Realty. As in Galvez’s case, the cost to stay was too high, and EGP decided to move to nearby Lincoln Heights. Throughout the process, Walker’s team was helpful, but there was no financial payout to move. Decoloma’s situation is somewhat different: she still has three years left on her lease and says the new owner is trying to force her out by making her stay difficult. He removed the air conditioning unit even though she told him it was working fine. In the process, the roof was damaged and water came pouring into her shop the last time it rained, said the owner of the Hot Stuff Haircutting Salon on North Figueroa near Avenue 57. Then he refused to make repairs or replace the air conditioner because “the AC wasn’t part of her contract,” she told EGP. “He wants me to get fed up and leave,” she said angrily. Her neighbor, the owner of Andrea’s Shoes, says her situation is worse. Not only does Salvatierra no longer have air conditioning, the month-to-month tenant says she’s in danger of losing everything because the owner wants to raise her rent from $1,830 a month to $3,457, if she signs a three to five year lease. In an Aug. 12 letter, property manager Clint Lukens Realty cited “recent changes in the neighborhood and the market rent of retail spaces” for the large increase. “We are happy to keep you…until we find a tenant to lease at market rent,” states the letter. When that happens, Salvatierra will receive a 30 day-notice to vacate. “I still can’t believe it; I left my job, my husband is sick. This business is all I have,” she told EGP emotionally. Lukens took over management of the property in June 2015 and denies ever harassing a tenant, but could not speak for the previous management company. According to Decoloma, she turned down a $35,000 offer to leave because it’s not enough. “I spent $24,000 to beautify this space … I provide work to two employees, I support the economy,” she lamented. “They are not just kicking me out, they are also leaving my employees and their families without income,” she said angrily. Organizers include the Friends of Highland Park, Concerned Community Members, Eviction Defense Network, BKR Gang and Drug Intervention Program, NELA Alliance and the Northeast Business Economic Development. “[Politicians] call it revitalization and it is not, it’s gentrification. They are displacing our community,” Priscilla Falter, one of the organizers told EGP. 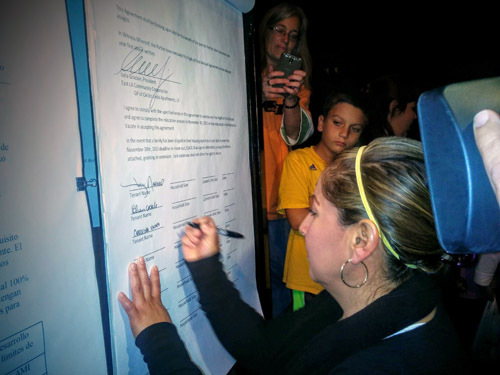 “We will ask [Councilman Gil] Cedillo to address the issue, he can’t ignore what’s going on any longer,” she said. A majority of Highland Park’s 60,000 residents are Latino, though many consider the community diverse. Thirty-eight percent of residents live at or below the poverty line and the influx of new property owners, higher-end businesses and “large-scale luxury development projects,” residential and commercial rents have skyrocketed, according to event organizers. Organizers have criticized Cedillo for what they claim is a lack of response and for his holding of a Latin Jazz festival at Sycamore Grove Park that has been a year in the planning on the same day as their event, which according to Falter “will offer legal services, translations, a food bank and a mobile clinic with mental health services. According to Cedillo Spokesman Fredy Ceja the issue is not unique to Highland Park and is growing. “We are now seeing developers not just buying one piece of property, but wanting to buy whole blocks in Highland Park, Lincoln Heights and even El Sereno,” Ceja said. Protestors want elected officials to reform and establish new rent control regulations to include businesses, and to raise the cost to “unscrupulous” landlords who evict tenants. They want them to put a stop to developments that do not address the housing crisis and to limit business permits and zoning that do not address the 38% poverty rate. What the city can do, given private property rights, remains to be seen. “The problem with owners is that instead of coming and talking to us, they are very cold-blooded,” Decoloma told EGP. She said the most frustrating part for her is that she is being asked to leave the location to make room for another hair salon. “It doesn’t make sense to me,” she said. Walker said he doesn’t understand why people paint all development with the same brush and see it as always bad. Saturday’s protest will start in the corner of York Boulevard and North Figueroa Street by the flagpole at 4pm, stopping at Cedillo’s office and ending in the parking lot behind Antigua Café where the resource fair will be held. Volunteers will include pro-bono attorneys, translators and mental heath workers. Much is being said and will continue to be said about the displacement of residents when real estate in a neighborhood suddenly becomes hot. Depending on who’s talking, someone in these transactions is doing something wrong; or right. Unfortunately, there will always be winners and losers when real estate is involved. But is it fair to criticize homeowners who want to sell their properties for more than what they were worth during the mortgage crisis? Studies have shown that for Latinos, their greatest source of wealth comes from home ownership. It’s what they depend on to get them through their retirement years or to pay for a child’s college education. On the flip side, the cost of rent is a deterrent to eventual home ownership or saving for the future, because a large portion of a lower-wage workers’ income goes to cover housing expenses. The issue has become more critical as housing has become less affordable and fewer affordable housing units are being built. Residential housing is not the only area where the impact of “gentrification” is being felt. In Highland Park, small businesses are being displaced when commercial buildings are sold to investors who buy at top prices for commercial property in hot areas. Many small businesses that have managed to survive during tough economic times now find themselves on the outs because they did not have long-term leases in place and cannot afford the higher rents developers need to charge to cover their costs and to see a return on their investment. In many ways, the unfolding story is one that sheds light on the inequality of business acumen that exists in this changing market. Small business owners used to doing business on a handshake and a promise are finding that hard work alone will not keep them alive. The reality is that many small shops and cafes just don’t have the resources to be able to move and pay rental deposits for a new location. They work on lean margins, because for a long time the majority of their customers were low-income and unable to afford high prices. Who’s to blame? There is no easy answer. New mortgages must be paid; taxes and the cost of refurbishing old buildings to their former glory require large investment of capital. What’s the solution? Again, there’s no easy answer. What’s clear is that small business owners, many who are Latino or Asian and have English as second language, need assistance gaining the business skill sets that will allow them to protect their businesses and to stay in business. To often, local city officials talk about helping small businesses, but that’s as far as it gets. It’s not likely to go over well, but perhaps what we need is to require new businesses owners applying for their first business license to attend a boot camp that will help them get the skills they need, like what’s involved in leasing property, in this marketplace. As a society, it’s in our interest for our government to provide services to small business owners who are in danger of losing their investments and equity, after all they do the bulk of hiring in this country.. If thi suggestion sounds to paternalistic, we’re open to suggestions. We believe that property owners should be entitled to sell and new owners should be entitled to make a reasonable return on their investment. It’s a tough situation we at EGP know first hand. The offices where we are located have been sold and we must undertake the heavy cost of moving to another location. It’s no ones fault; it’s just the way things are. We understand the financial risk investors are taking when they enter a new market, and empathize with those who feel the burden of paying for the risk. New “affordable” housing planned for Boyle Heights will be too expensive for the eastside neighborhood’s low-income residents, affordable housing developers were told last week during the first of several community meetings planned to discuss projects being built on Metro-owned land. Approximately 120 people attended the meeting at Casa del Mexicano, a long time community center now under the management of nonprofit neighborhood asset builder and housing developer East Los Angeles Community Corporation, (ELACC), which together with Abode Communities, another nonprofit developer, coordinated the “Affordable Housing 101” workshop on May 7. The plan was to explain in easy to understand terms why more affordable housing is needed and what it takes —from political will to sufficient revenue — to get it built. The developers hoped their Power Point presentation — loaded with data on the current affordable and market-rate housing pool, wages, and rents — and the hands-on activities they’d planned would adequately explain their costs and the formula they used to set income eligibility requirements, but that turned out not to be the case. Instead, for nearly two hours, ELACC and Abode fielded questions and comments challenging their interpretation of “affordable,” and the data they used to get there. “Your numbers are going way up and we are way below” the low-income numbers you are using, shouted one resident in response to the eligibility income levels included in the developers’ presentation. 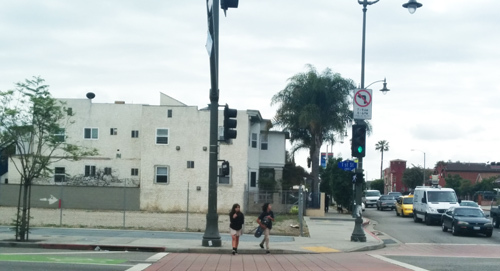 Located just east of downtown Los Angeles, Boyle Heights is over 94% Latino, very dense with little vacant space, which makes developments on Metro’s four vacant lots targets for closer scrutiny. The lots are located at 1st Street and Soto; Cesar Chavez and Soto; 1st Street and Boyle and 1st Street and Lorena. The group says ELACC and Abode are using the Area Median Income for the County when they should be using Boyle Height’s lower median income to calculate eligibility. According to ELACC, a family of four with an Area Median Income (AMI) of $24,900 or less would pay $560 for a two-bedroom apartment, while families making up to $33,200 would pay $747 for the same apartment. Most financial planners recommend against spending more than 25% of your income on housing, a difficult task in today’s extremely tight housing market. According to the developers’ presentation, 61% of renters in Boyle Heights spend more than 30% of their income on rent, while 34% pay more than 50% of income on rent. “I earn $1,150 per month with three members in my family and I pay $740 for rent,” said Salvador, a resident of Boyle Heights. “I have to go to churches to ask for food,” he said, telling the developers they should base rental rates on what a person living below the poverty level actually earns. In the 6.2 square-mile area of Boyle Heights, about 18% of people live in “severely” overcrowded households, according to the American Community Survey 2009-2013. Of the rental units available in Boyle Heights, 8% (1,311) are affordable, the rest, 92% (15,054) are market rate units, according to ELACC. ELACC President Isela Gracian tried to reassure the audience that they are not working against the low-income community, but are on their side trying to build more affordable housing. She emphasized, however, that one project is not going to solve the affordable housing crisis, citing as an example of the great need ELACC’s experience with the 53-unit Sol y Luna complex that recently opened in Boyle Heights. She said they received over 2,000 applications for the 53 available units. Not all the applicants were from Boyle Heights, she said, explaining that federal law prohibits discriminatory advertising in housing, so people from everywhere were eligible to apply. About 50% of the current residents at Sol y Luna are from Boyle Heights, she said. Ana Hernandez said Boyle Heights residents like her worry that “developers will not build enough” housing to meet the huge need. Union de Vecinos member Elizabeth Blaney told EGP they are concerned that the stated eligibility income levels “don’t really match” the real median income in Boyle Heights, which is below $25,000. She said gentrification is adding to the problem. “Families are being displaced due to the high rent and locals have to go somewhere else because they cannot afford the market rate rent,” Blaney said, adding that the proportion of affordable units to market rate units is much too low. The group wants Metro to tell its developers to build more units for families making less than $25,000 a year. Otherwise, the proposed projects will continue to displace low-income tenants and not meet the needs of the community, she said. According to Gracian, they use the AMI guidelines set by the Federal Housing and Urban Development Department (HUD), which are updated each year. “The minimums [income levels] are not set because those are linked to the actual rents for the apartments. An individual could qualify for a unit that is at the 30% AMI with income as low as $15,000 a year, the $17,130 is a maximum,” she explained. Although there were many heated comments made at the meeting, Gracian said they did not feel they were being attacked because they understand the serious housing problems low-income families face. “They underscore the urgency and need for affordable housing, we need more residents to advocate for this,” she said. More meetings are scheduled, for the complete list, www.elacc.org.